PLATFORM VIDEOS AVAILABLE ON YouTube! 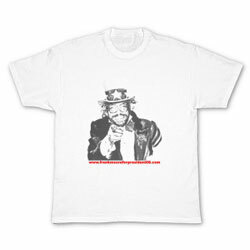 "Are you a US citizen? Love party and weed? 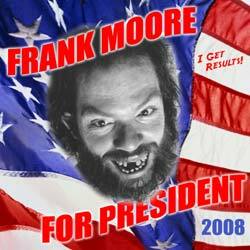 Vote for Frank Moore!" Download the write-in information poster here to print out and put up in your neighborhood! 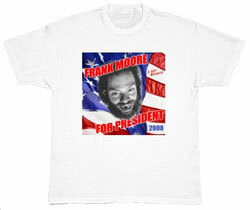 Download classic Frank Moore For President 2008 and Moore/Block 2008 posters here! y'all come to celebrate our 2-year presidental campaign!!! it will start around 6pm or so! bring a dish, something to grill, and anything else you can think of! Presidential Candidate Moore is available to speak with your group or appear at your event. Contact him via email. KALX in Berkeley ran a spot on Frank's Campaign and platform during the news. Listen here. Frank was mentioned on the The Overnightscape Underground. Listen here to the segment. Visit the web site for the full show. Listen to L'Idealiste, an audio collage created by Rafael-Alexandre Ramos featuring Frank's platform. WMFU.org in New Jersey did a segment on Frank. Listen here. Frank (and logo) were featured in this Sacramento News & Review article. 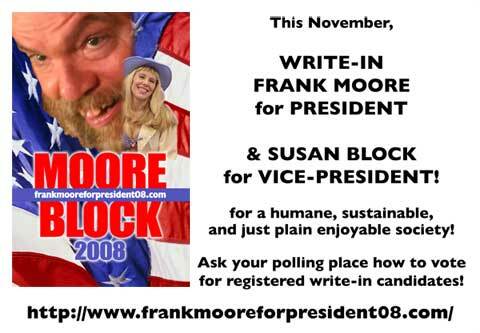 We've compiled a blog with information on how to write-in Moore/Block in your state, "How To Write In Frank Moore For President in 2008". We've created a map showing the states where Frank Moore is a qualified write-in candidate. Our election forms were hand delivered to Sacramento! We are the first write-in candidates to do so in California! See photos here! Read about the Presidential Campaign Cruise on SF Bay and see photos here! KPFA News ran a piece on Frank's candidacy and platform. Listen here. We have compiled the "US Presidential Write-in Candidate Requirements for each State"
Compare my healthcare plan to those of John McCain, Barack Obama and Hillary Clinton here. An article on Ballot Access by Richard Winger. 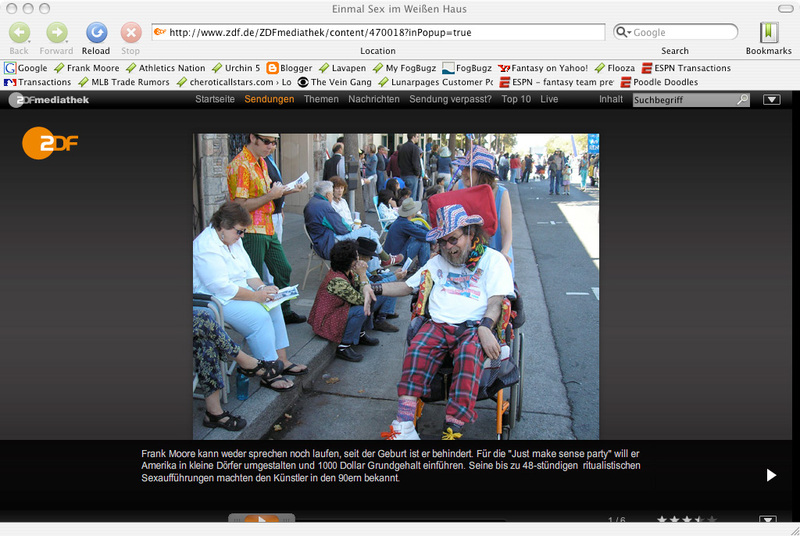 German TV station, www.zdf.de ran a photo and caption on their website. See the News for a translation of the caption. Also read Frank's original interview. See the original layout in Polish here. How Berkeley Can You Be? Festival 2008. Watch it here. How Berkeley Can You Be Parade and Festival Watch it here! Frank Moore Campaign Speech, 1.21.08, Cafe Leila, Berkeley, CA. Watch it here! Frank Moore's Shaman's Den. Postal Worker and labor activist, Carl Bryant, grills 2008 presidential candidate Frank Moore on his platform. Recorded August 26, 2007 in Berkeley, California. 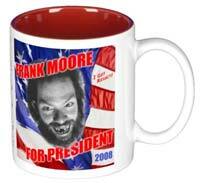 Get your Frank Moore For President 2008 merchandise! Visit our store for the complete collection of goodies! Buttons, magnets & bumper stickers! Printable version of platform available here. I’ll do away with welfare and social security. Instead, every American will receive a minimum income of $1,000 a month. This amount will be tied to the cost of living and will not be taxable. We will have universal prenatal-to-the-grave health care and universal free education with equal access. Compare my healthcare plan to those of John McCain, Hillary Clinton, and Barack Obama here. I’ll do away with all tax deductions for over $12,000 income. Instead, there will be a flat tax of 10% on annual income of less than one million dollars for an individual and less than five million dollars for a corporation. But the flat tax will jump to 75% on annual income exceeding these limits. I’ll cut the military budget by at least half. Public mass transit will be free, 24/7, and reliable. All patents and copyrights will expire in 20 years. Inventions, products, etc. which are developed with governmental money and/or public institutions can not be patented. All businesses selling their products in the U.S. will have to certify that their products were manufactured in accordance with this country’s labor, wage, environmental, and safety laws ... that they meet or exceed these ... no matter where they were produced. Each city and each “media market” will have at least two public access channels on radio, broadcast television, cable, AND satellite! Election day will be a paid holiday. I will push for complete public funding for all political campaigns and the banning of political contributions and the use of personal wealth in political campaigns. The President should have a line veto. But the Congress can over-turn this line veto by a simple majority. Also bills should be limited to 5 pages in length and/or limited to one subject. An individual taxpayer will be able to direct her taxes to what functions she wants to support. But corporate taxpayers should not have this option. Every corporation should come up for a renewal every 25 years, at which time it must prove that it has been operating in the public interest. If it fails to do this, it loses its right to exist. Corporations that have existed before this policy will have 10 years before they will have to prove they are worthy. The end of hunger, poverty, and discrimination in this nation will be my main focus domestically. This will also shape my foreign policy. The minimum income and the minimum/livable wage, linked to the cost of living, will rise every time the congress members vote themselves a pay raise…will rise by the same percentage of their raise. Education should be federally funded, based on the number of students, adjusted to special needs of each student, in each school district. But schools should be locally controlled. The equal access of education for every student will be insured by the federal government. I will call for a major rebuilding of America. We will repair our school buildings and will build needed new schools. I will encourage a society of small villages connected by mass transit. Within these small villages, people could walk or bike to work, to school, to shopping, to entertainment, etc. Mass transit will combine these small villages within 15 miles radius into dynamic communities. Living in these villages will end gridlock traffic, will cut greenhouse gasses, will cut stress and isolation. Housing for all incomes will be included equally in each village. We will encourage electric cars, fast trains, clean sustainable decentralized energy generators. I would shut down all nuclear generators. I will destroy 10 percent of our nuclear weapons each year to reverse the nuclear arms race. We will stop giving/selling arms to other countries. All private arms sales should be illegal. Now my policies are pro-business. The universal education system will provide business with a superior, flexible work force. The minimum income and the universal health care will remove the business’s burden of providing health insurance and pensions to workers. In reality, this relief will be much more than any tax cut could give. Moreover the minimum income will make the starting and maintaining a small business much easier. This is also true for small family farms. The minimum income will encourage independent invention and artistic pursuit, on which true progress depends. The primary function of the government should be the protection of the health, the civil and human rights, the freedoms, and the general welfare of the people…instead of the protection and the promotion of corporate profits and interests. The government should exist to serve the people, and not to make a profit on the services to the people. My administration will be governed by these basic principles. I will bring the troops home from Iraq immediately. Moreover, I will change this country’s self-image from that of THE SUPER POWER/WORLD LEADER to that of a member of the global community. Prisons should be only for violent or otherwise dangerous criminals. Prisons should be a part of the health and educational system and should include drug rehab programs. This should also be true for the new creative in-community programs for non-violent criminals for paying-back, rehab, and education sentencing. These programs will be more effective and much less expensive and harmful to the community on every level than the current human warehouse system. Flexibility of sentencing should to be returned to judges. I will ban the death penalty. The use of drugs should be legalized and taxed. Pot and spirits should be sold over the counter to adults only. Tobacco and other addictive drugs should be sold by prescription only. Free drug rehab programs should be readily available. All of the opt-out schemes should be illegal. If a corporation wants to sell your information, it first should directly and clearly get your permission. Before this happens, all such information is a part of your privacy, not the property of a corporation. The selling/buying of debt should be illegal. THIS PLATFORM OF MINE GIVES YOU AN OUTLINE OF WHAT WE WILL DO TOGETHER, OF WHAT I SEE THIS COUNTRY AND THE WORLD BECOMING…IT IS DEFINITELY POSSIBLE, IF WE ARE WILLING. YEP, IT IS RADICAL. BUT IT JUST MAKES SENSE! DOESN’T IT? The selling/buying of debt should be illegal. Moreover, there should be a maximum interest rate of 10 percent on the original principal over the life time of a loan. I will forgive the loans to the so-called third-world countries over the original principal. We will use half of the money we will save by cutting the military budget to pay down the national debt. I will reduce the pollution caused by obscene corporate profits. I will also reduce the federal government while raising services to the people by getting rid of welfare, social security, the so-called war on drugs, etc., and by the cuts in the military, the I.R.S., prisons, etc. If this just makes sense to you, vote for Frank Moore for president by writing him in! Together we can create a sane and humane society. Last modified March 15, 2019. This site is designed and maintained by Michael LaBash Graphic Design.